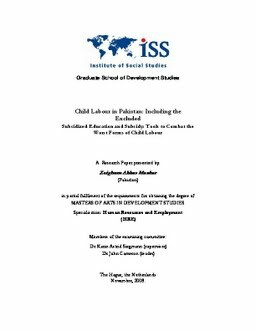 This research seeks to analyse potential for transition of child labour to the formal education system. Education is believed to be an effective antidote to the problem of child labour. Its hypothesis is that children drop out of schools because their parents may be too poor to afford schooling and require the additional earnings of their children for economic sustainability of the household. This decision of parents can be reversed if there are incentives circumventing income considerations behind child labour and replacing them with subsidized education and monetary support to the household.